Hong Kong's (pictured) luxury apartment market saw a rental cost change increase of 3.7%. 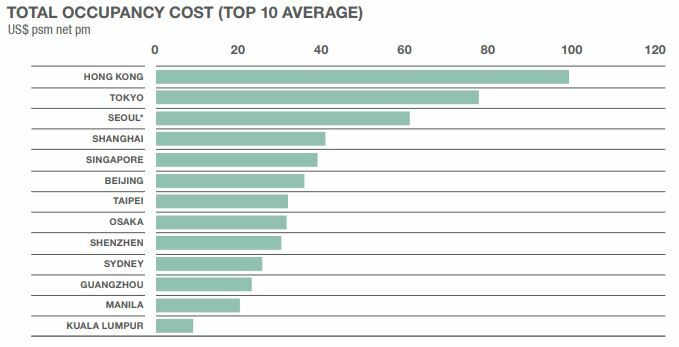 Total occupancy cost (top 10 average). Savills Prime Benchmark report as of July 2018 saw the luxury apartment market across the Asia Pacific region rose slightly over the first half of the year for most cities with many seeing increases across changes in rental costs. Beijing and Shenzhen both saw an early downswing, while Taipei and Kaula Lumpur were later. Early upswing took place in Hong Kong and Singapore. Click here to view Savills Prime Benchmark Survey, July 2018. For more information or to discuss the report, phone or email Simon Smith, Senior Director at Savills Hong Kong via the contact details listed below.